First the disclaimer..... There are as many methods as there are growers. Some grow beautiful helis using methods totally opposite from these. It is not my intention to imply that you must follow these recommendations to be successful. I present this guide as what "I"do and what "I" believe works best for "me" based on "my" years of experience and research. Your experiences could vary greatly based on your specific conditions and needs. My heils are grown indoors under totally artificial conditions. Take from it what you want, leave what you don't. When new helis arrive, their roots are usually stressed or sometimes nonexistent. This poses the problem of desiccation via transpiration and evaporation. In other words the plant's water loss exceeds water intake and it dries out. 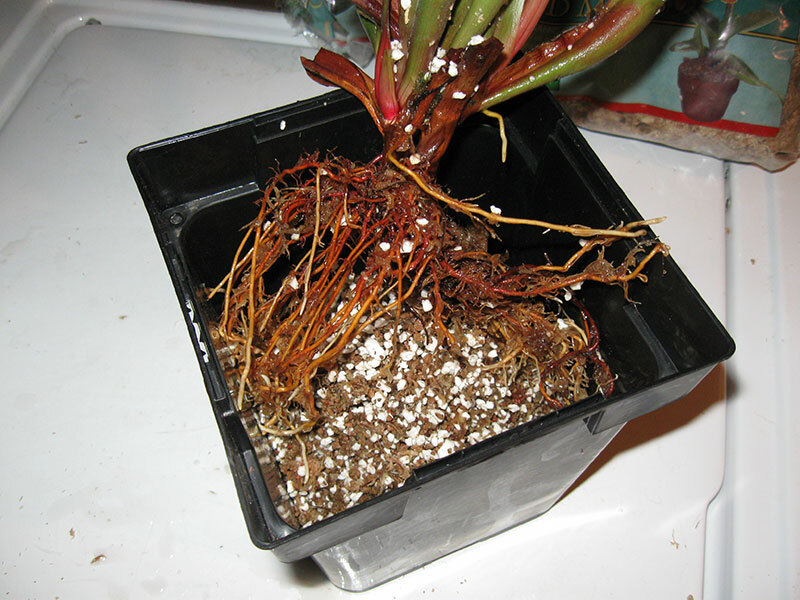 At some point in this process the damage incurred exceeds the ability of the plant to recover and death soon results. The plant gets the majority of its water via the roots through osmosis. When the roots are stressed or nonexistent then obviously their ability to process moisture is reduced. The majority of water losses are through transpiration and evaporation. These loses are directly related to the vegetative mass, ambient temps, ambient humidity and airflow rates. Bagging the plant during this phase is a common practice. This helps buy the plant time until the tender roots recover from the damage incurred in shipping and transplanting. We want to keep the humidity levels high, airflow low and temperatures reasonable. Then as the plant heals we slowly acclimate through a gentle introduction into the new environment. Sometimes the more aggressive approach of trimming back the vegetative mass is also used. A similar problem occurs when a plant is grown under tender conditions. In this case it is not so much root issues as much as it is acclimated to a more highland condition. A plant will not use energy developing moisture holding capacity if it is not needed. This would be a waste in energy. Finally, sometimes we encounter both conditions at once. In any case the procedures are basically the same. Take steps to reduce moisture loss until the capacity for moisture intake is sufficient. This has several major benefits IMHO... First it makes sure the plant is fully hydrated, secondly it softens the roots preventing as much handling damage as possible. It also makes sure the plant is well inoculated with the beneficial Trichoderma fungi. I will often let the division soak overnight prior to potting or shipping. 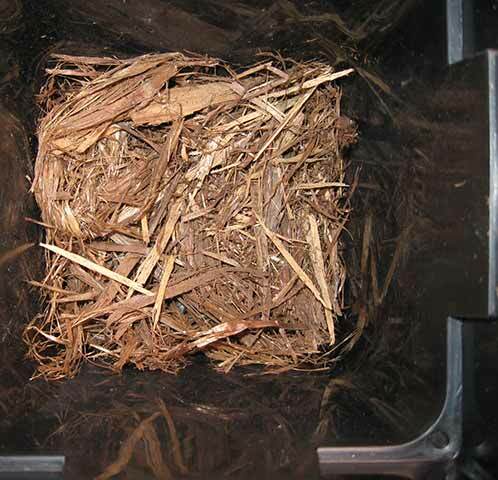 Over the years I have found some other blends that grew the plants a little better maybe (Cypress bark based mixes). However, they required way too much attention. The LFS/Perlite/APS combination has provided me a very good level of performance while maintaining low maintenance requirements. APS is really the key here, it holds moisture while providing good structural strength with no compression issues. 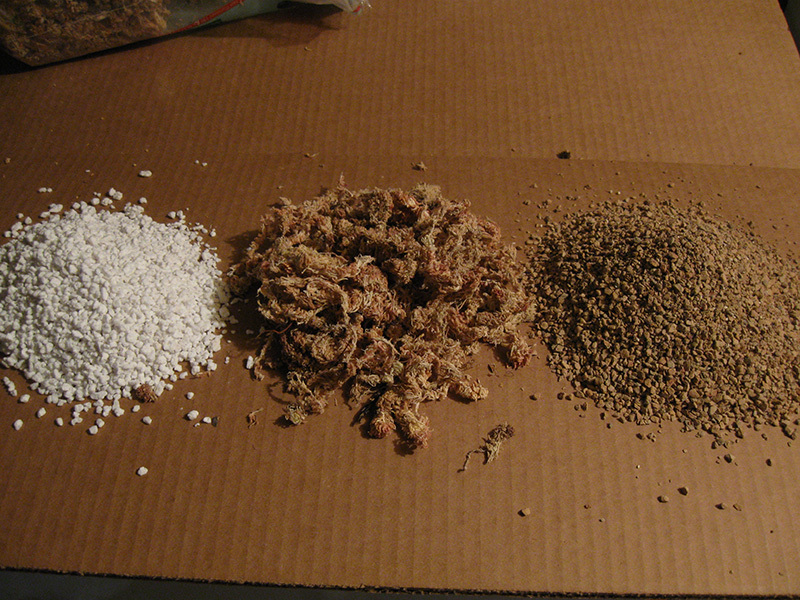 Perlite is nothing more than an aggregate really, it provides zero nutrition and zero moisture buffering. While many use it with great success, I found 1:1 blends of LFS and perlite to have inadequate moisture buffering and poor root strength. Next I place a shallow layer of cypress bark to protect the pot's drain holes from clogging. Followed by an initial layer of my substrate mix forming a mound in the middle. Taking the division (In this case with good root structure) I straddle the mound with it. This insures good root separation. 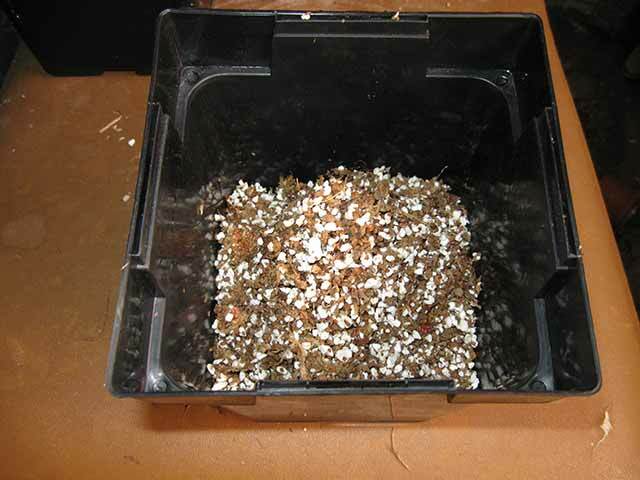 Then simply fill the pot up without packing the substrate... I simply tap the pot on the table to shake the substrate down into place without root damage. Now fill the pitchers up with a weak fertilizer mix, I like 1/4 strength. Most any fert will do fine, but I prefer orchid ferts or the popular seaweed based product. If your grow area humidity is less than 80% or so, it is a good idea to bag the plant until new growth is observed. 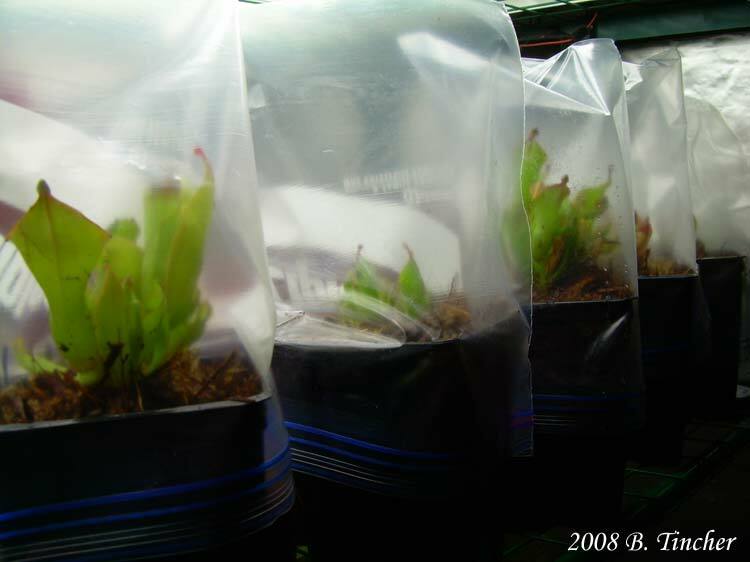 Then slowly acclimate the plant by cutting off the bag's corners and continue to open these up slowly over the next few weeks. 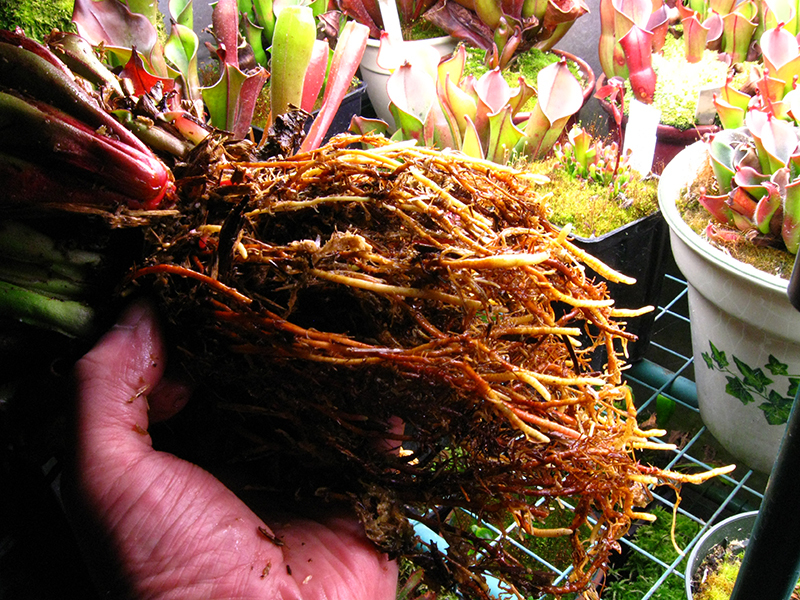 I have over a 95% success rate using these methods with all species of Heliamphora if the divisions are of good quality. With rootless divisions, I have over a 90% success rate. My methods are almost identical for those with the exception of a deep top layer of live sphag. 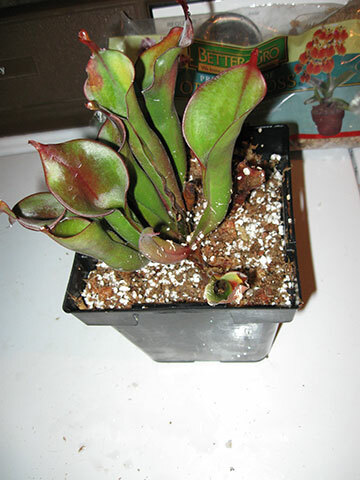 I also cut open any unopened pitchers to facilitate watering and feeding. I feel feedings are critical for rootless divisions, we are asking the plant to produce root growth with a very limited ability for nutrient uptake. 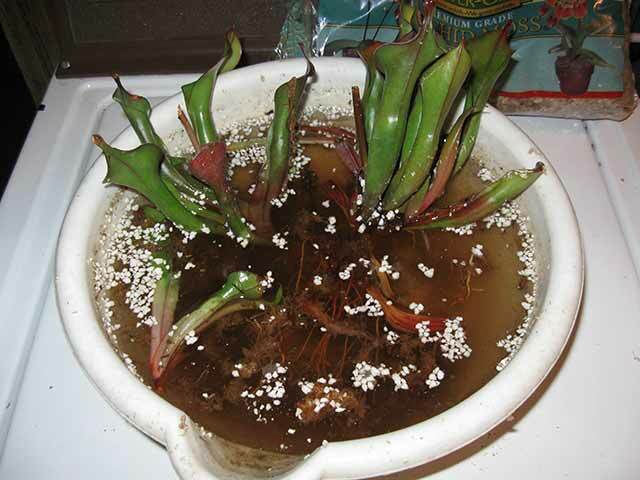 Pitcher feeding during this time provides these much needed nutrients. 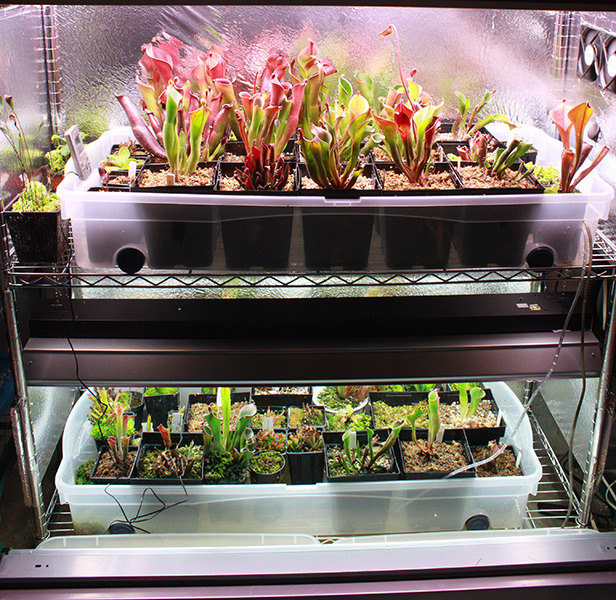 Bottom shelf is my "nursery" area for immature plants/recent divisions/more common species/duplicates/etc. Last edited by Av8tor1; 05-13-2012 at 01:16 PM. You're welcome heli.... hope it helps. You need to call ampacbiotech and speak with Kelly. They have no online shopping cart. Last edited by Av8tor1; 10-25-2011 at 05:21 AM. oh ok thanks, do they come in different size containers because I don't want to get a large amount, how much does it cost? OMG...this is great! Thank you soooo much! Wasn't expecting a whole thread instead of just a PM in response to my questions. This is awesome!